Reading, MA – Reading Cooperative Bank recently observed the 80th birthday celebration of Elena Dluznieski, long-time Banking Specialist and staple at RCB’s Woburn branch. 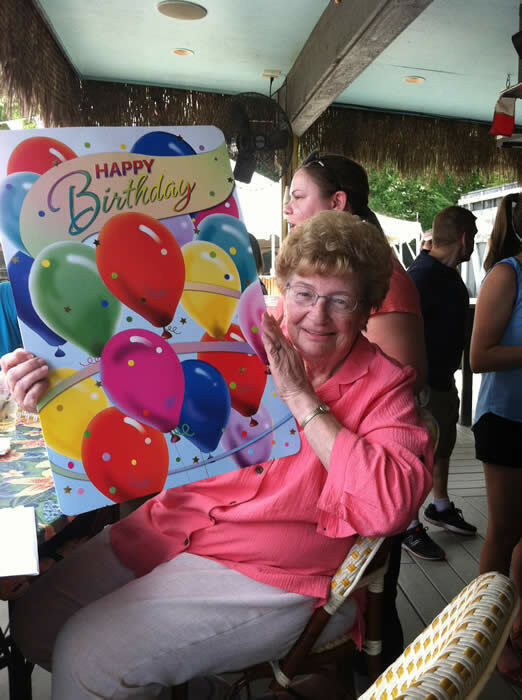 Elena was surprised with a birthday cake and a heartfelt speech from Danny Walbourne, her Woburn manager, at RCB’s summer outing at the Nashoba Valley Tiki Bar & Grill in Westford, MA. The bank used the occasion as an opportunity to acknowledge the various accomplishments of its veteran employee. Over the years, Elena has helped to develop many quality relationships with visitors of her branch, being a face that customers recognize and delight in seeing. She is a known storyteller who provides her fair share of comic relief. Elena takes her caring and affable nature to places well beyond the bank, as well. She’s been a volunteer for the Reading High School Marching Band and Color Guard for over 30 years and has helped to establish college scholarships. Elena is also known for diligently looking through all the local newspapers to cut out – and submit to the Marketing department – any articles that feature RCB or mention individuals who work at the bank.